Who doesn’t love caramel sauce?! But it can be intimidating to make, and time consuming. Not anymore. This version has only 3 ingredients and is made in 10 minutes! 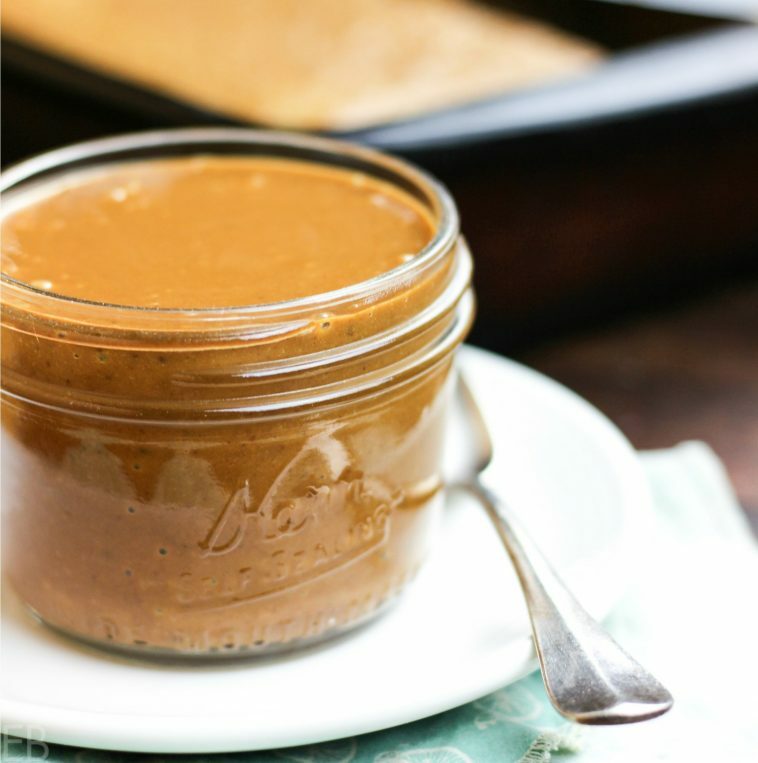 You’ll LOVE the outcome and be making it everyday for all your caramel needs! 🙂 Spread it on your morning Paleo waffle with applesauce! Tower it with AIP Biscuits, fruit and coconut whipped cream. Dip your apple slices (or fingers) into it. Make caramels. Spread it on cake. Pour it over your moist and beautiful Caramel-Chocolate Mug-Muffins (recipe below)!! Or make Pear Upside Down Cake (coming this week!!)! 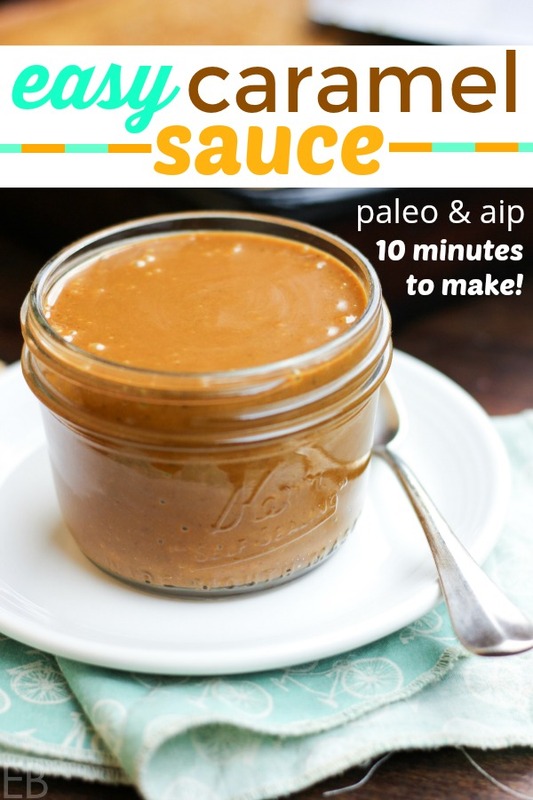 Paleo & AIP Easy Caramel Sauce is grain-free, refined sugar-free, dairy-free … and there’s a dairy variation if you prefer a Primal version. Enjoy!! Oh, and this would also make a cute and loving gift, shared in a small mason jar with a ribbon tied around the top, for the holidays! Going back to forever I have loved this combination; haven’t you? Caramel and Chocolate Cake are SO special together. This mug-muffin setting makes that combo so adorable and accessible: easy to make and appealing to eat. I love that we just grab a spoon to eat it! Better than a fork, yes? Enjoy this decadent use for caramel. And enjoy my classic Paleo Chocolate Cupcake/Muffin recipe!! I’ll publish it soon all by itself, but for now, it’s too good in this recipe not to share it! I honestly don’t know! We always eat it within 2 days! I first started making this recipe by luck. I just tried the ingredients, and it worked. Super happy and amazed. Then I cooked with it for a dessert I was making, and the next morning we finished it for breakfast. My guess is 5 days minimum, but maybe 2 weeks. Typically, coconut cream spoils within about a week, but the coconut sugar cooked into it may lengthen that. I suggest you eat it quickly and share any leftovers!! Much love and enjoy! Makes 1-3/4 cup Caramel Sauce. If you plan to make the Caramel-Chocolate Mug-Muffins, add an additional 40 minutes to the overall time it will take to make the recipe. Once simmering, reduce heat to low and maintain simmer for 8 minutes. Stir occasionally. Turn off heat and stir in sea salt. Caramel will continue to thicken as it cools. Keep warm if you want it runny. Or refrigerate to make soft, chewy caramels. See Recipe Notes for Caramel-Chocolate Mug-Muffins! Here's my basic Chocolate Cupcake/Muffin Recipe that's great!! I'll publish it separately some day soon, but in the meantime ... ! Chocolate Cupcake batter (dairy-free) for Caramel-Chocolate Mug-Muffins! Lightly grease oven-proof mugs. Preheat oven to 325 degrees Fahrenheit. Combine all wet, room-temperature/warm ingredients in large bowl. Combine all dry ingredients in medium bowl. Add dry ingredients to wet ingredients. Stir to combine; do not over-mix. Scoop about 2 ounces batter into each mug. Place mugs on cookie sheet. Bake in preheated oven 25 minutes, or less. Test for doneness with toothpick; look for moist crumbs adhering. Remove from oven. Cool slightly. Top with warm caramel sauce! Chill or eat immediately! How will you use your Easy Caramel Sauce?! OOHHHH, this looks so good. And so easy!! Must have this stat!! I am a sucker for caramel…and this one looks delish! I can’t wait to make the mug muffins with it! My family will die for those, so special!! This sounds divine! I didn’t know caramel sauce was this easy to make. I can’t wait to try this out. Plus those mug muffins!!! It really isn’t usually LOL. I’m still amazed myself that this worked! Ohh I can think of SO many things to put this on! I have made caramel with coconut cream and regular organic cane sugar, but love the coconut sugar idea – and the color it gives is gorgeous! Thanks, Renee! I can’t believe the magic that coconut sugar creates! My husband raised his eyebrows up and down at me when he tasted it, and he’s always honest! He loved it. Pretty cute. I can’t believe how easy and fast it is to make! And the color is almost instant. I have to laugh at how long I used to spend making “real” caramel sauce. This looks so good, I’d be nearly tempted to put it on my dinner – ha! I love the simplicity of the ingredients and how much it looks like real caramel. Perfect for some homemade paleo apple ice cream, I reckon. Beautiful! Thank you Irena! It would be delicious to swirl the caramel in apple ice cream, seriously yummy!! This is amazing! I love how simple it is! Megan, for the coconut cream in the caramel sauce, are you using the solid part of a can of coconut milk (minus the “water”), or is this the dry coconut cream that comes in a jar? Hi Megan, this looks incredibly delicious and fun, as always!! My question is, what is the chocolate topping on the mug cakes that you swirled the caramel into? Wow does this ever look decadent! Love the mug cake too, nothing better than chocolate + caramel! 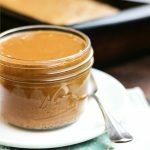 This caramel sauce looks superb, and I can’t wait to try this mug muffin!!! I couldn’t believe that such a delicious dessert could be made so easily until I tried this recipe. The mug cake was delicious as well as healthy. I added some pecans to add crunch. If you are not on the keto diet, I would suggest topping this mug cake with some extra nuts.